A controversial stoppage-time goal salvaged a 3-3 draw for Bournemouth against West Ham in a thrilling Premier League encounter at Dean Court. Hammers skipper James Collins had a hand in both first-half goals, heading his side into a seventh-minute lead, only to gift-wrap Bournemouth's equaliser. The Wales defender ghosted free in the box to nod home an early corner but Howe's men rallied quickly and ought to have struck when Josh King toe-ended wide when sliding onto Wilson's smart early cross. Wilson latched onto Jordon Ibe's smart flick-on to outfox Angelo Ogbonna before dispatching an accurate far-post ball, only for King to fail with the finish. King missed another gilt-edged chance, blasting wide from another cutback, in a move where referee Madley missed Ogbonna hauling Wilson to the ground off the ball. The Cherries finally levelled when Collins miscued an attempted clearing header and the deflection dropped kindly to Dan Gosling, allowing the former Everton midfielder to drill home Bournemouth's first Boxing Day goal in the Premier League. Gosling's first top-flight goal since the 2-2 draw with Sunderland on November 5, 2016 left the scores locked at 1-1 at the break, but not before Simon Francis was booked for a nasty-looking high foot on Cheikhou Kouyate. 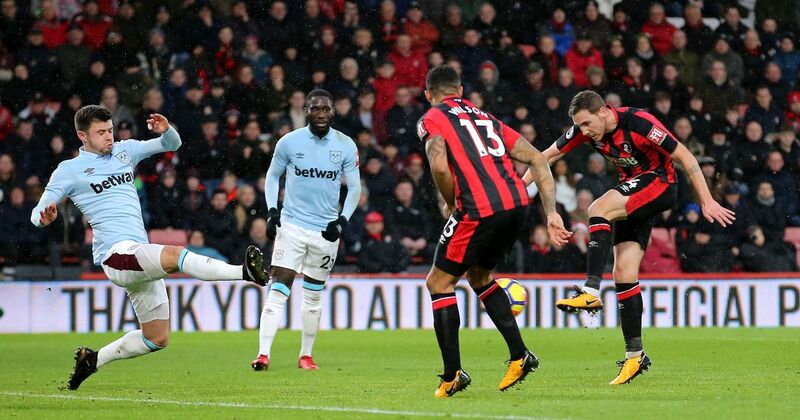 Bournemouth finally doubled their tally when Ake turned home Lewis Cook's low cross that had bobbled through the West Ham box after a corner, and Moyes chose to shake things up by bringing on Andy Carroll and Hernandez. Arnautovic's eight-minute double turned the game on its head but just when the Hammers thought they were home and hosed, up popped Ake to head goalwards and Wilson's shoulder appeared to have the last touch before the ball crossed the line.